It's almost the most wonderful time of the year in Myrtle Beach and the surrounding areas! With Thanksgiving just around the corner, it's time to get started planning for your beach getaway to the Grand Strand for the best in Black Friday shopping experiences that are sure to make everyone on your holiday gift list smile from ear to ear! Explore some of the top shopping destinations in the Myrtle Beach area during your Black Friday 2018 condo rental experience. Start at the north end of Myrtle Beach by spending some time at Tanger Outlets and the Myrtle Beach Mall. Both shopping destinations are located on Highway 17 North, making them convenient and within close proximity to your accommodations and other Myrtle Beach experiences. With hundreds of shops and dining options between the two of them, you'll have plenty of opportunities to grab everything on your holiday shopping list! The fun begins the day before Thanksgiving at Tanger Outlets, which are open on Wednesday, November 21, from 9am to 9pm. After taking a break to celebrate the holiday on Thursday, November 22, Tanger will reopen that evening 6pm and remain open continuously throughout Black Friday until 10pm Friday night. Visit stores like Coach, Ralph Lauren, H&M, and so many more whenever you shop Black Friday sales Myrtle Beach. After you've completed your shopping at Tanger, head across the street and check out the stores and restaurants at the Myrtle Beach Mall! If you're looking to shop in Central Myrtle Beach, be sure to stop by Coastal Grand Mall for a truly grand holiday shopping experience. You can get your pictures with Santa, choose from a variety of dining options on-site, like Cracker Barrel, Logan's, and of course, get in all of your holiday shopping at stores like Belk, Dillards, JCPenny's, Bed, Bath, & Beyond, and much more! The sales start Thanksgiving week, so stop back by for updates on Black Friday hours and more. Not to mention, you can also head right down the street to Tanger Outlets second location on Highway 501 to keep the shopping going! As you drive further south, make a stop at the Market Common for another extravagant shopping experience. This upscale, outlet-style area features stores and boutiques like Anthropologie, Southe Living, Pottery Ba, Baes & Noble and more! The area will be bursting with excitement starting on Thanksgiving Day, when the annual Turkey Trot Race takes place in Valor Park and the Market Common at 8am. Stores will remain closed on Thanksgiving, but they will reopen bright and early on Black Friday at 8am. Get your holiday shopping season started with a trip to the Market Common! 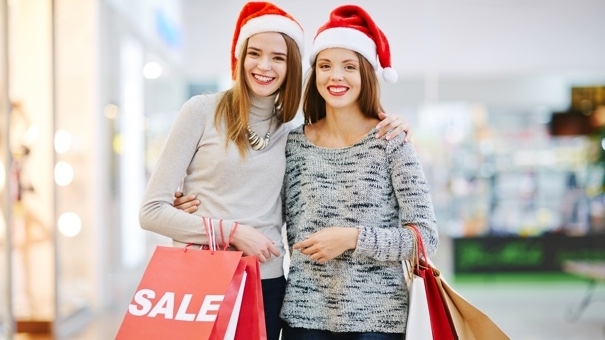 No matter where you choose to shop on Black Friday, your Myrtle Beach getaway will offer you the best deals for all of your holiday gift lists. Spend Turkey Day on the beach, and then head out for a thrilling Friday of hustle, bustle, and fun when you reserve one of our spectacular condos during this holiday week!